We use the very durable "thermo-film" for our names and numbers. We stock "Pro-Block" but can custom order any other styles. We keep a large variety of colors in stock. No minimums, you can just do one. 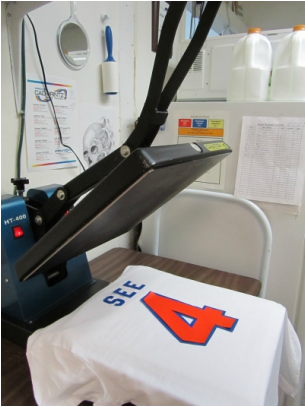 You can bring your own shirts for names and/or numbers or we can provide you with shirts and printing if needed. Generally it takes us just a day or two to apply names and/or numbers. Sometimes you can even wait for one or two pieces. During the start of a season, we can get really busy, and it might longer, so please plan ahead!